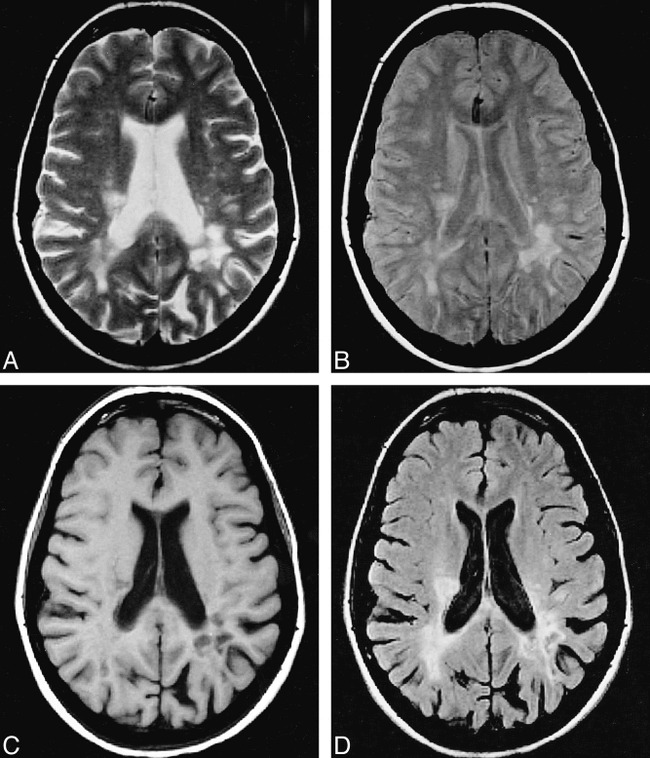 BACKGROUND AND PURPOSE: Hypointense lesions can be visible on fast fluid-attenuated inversion recovery (FLAIR) MR images of the brain of patients with multiple sclerosis (MS), and they may be produced by severely damaged white matter. To test the role of these lesions as an MR marker of MS severity, we assessed their relationship with clinical findings and other MR measures. METHODS: Using a 1.5-T scanner, dual-echo rapid acquisition with relaxation enhancement, fast FLAIR, and T1-weighted MR images (24 axial, 5-mm-thick contiguous interleaved sections) were obtained from 50 patients (32 with relapsing-remitting and 18 with secondary progressive MS). RESULTS: Hypointense lesions were visible on the fast FLAIR images of 19 patients (mean number of lesions, 7.8; range 1–22); their median load was 1.4 mL (range, 0.05–12.6 mL). The median lesion load was significantly higher in patients with secondary progressive MS than in those with relapsing-remitting MS on the T1-weighted images. Both the number and the load of hypointense lesions shown by fast FLAIR imaging were significantly higher in patients with secondary progressive MS. Significant correlations were found between Expanded Disability Status Scale scores and MR lesion load. A multivariate analysis showed that only the presence of hypointense lesions on fast FLAIR images significantly separated cases of relapsing-remitting MS from cases of secondary progressive MS (relative risk, 7.1; 95% confidence interval, 2.0–25.9). CONCLUSION: The presence of hypointense lesions on fast FLAIR images was a strong predictor of disease severity in cases of MS, although the low sensitivity of this approach might limit its use for the assessment of MS evolution. MR imaging of the brain provides objective measures of disease evolution in patients with multiple sclerosis (MS) (1, 2). Virtually all the current clinical trials in MS are being monitored with MR imaging, and changes in lesion burden on serial, conventional T2-weighted MR images are widely used as a secondary outcome measure (1, 2). In the North American interferon β-1b trial (3), the final approval of this treatment by the Food and Drug Administration was based on drug efficacy in both reducing the frequency of clinical relapses and preventing the increase of total brain MR lesion load over time. Conventional T2-weighted MR imaging has, however, a poor pathologic specificity, and this results in weak correlations between lesion burden and disability in patients with established MS (1, 2, 4, 5). Although the finding of relatively decreased signal intensity (SI) on T2-weighted images of the basal ganglia of patients with MS had been correlated with greater disease severity (6), this was not confirmed by a more recent study (7). For this reason, there has been increasing interest in MR techniques, such as T1-weighted hypointense lesion load assessment (8, 9), proton MR spectroscopy (10), magnetization transfer imaging (11), and quantified measurement of brain and spinal cord atrophy (12, 13). These techniques seem to be able to provide additional and more specific information on demyelination and axonal loss, which are the disabling elements of MS. Among these techniques, the assessment of hypointense lesion load on T1-weighted images has the advantage that it is easy to perform and to standardize across multiple centers. Several pieces of evidence support the hypothesis that hypointense lesions on T1-weighted images are the MR equivalent of demyelination or axonal loss. It has been demonstrated (14) that they are characterized by low magnetization transfer ratio values, indicative of structural loss in the brain tissue (14). Second, in a recent pathologic study (15), the degree of lesion hypointensity was inversely correlated with axonal density. Finally, in patients with MS, T1-weighted hypointense lesion burden was strongly correlated with the degree of disability (8) and its progression over time (9). Fast fluid-attenuated inversion recovery (FLAIR) (16) imaging, which permits the generation of heavily T2-weighted brain images with suppression of CSF signal, has some advantages over conventional spin-echo (CSE) imaging when obtaining images of the brain of patients with MS. Because all MS lesions have long T2 values (17), they are well defined by such a technique, and the suppression of CSF signal further increases the sensitivity of fast FLAIR images for their detection. Several authors have reported that fast FLAIR imaging detects more MS lesions with a higher conspicuity than does CSE imaging (18–24) and that it is also more sensitive and reproducible when assessing brain lesion volumes with MR imaging (18, 19, 22). Areas of hypointense signal are sometimes visible on fast FLAIR images of patients with MS (25). It is well known that hyperintense MS lesions visible on T2-weighted images represent a heterogeneous population with varying pathologic substrates (26), ranging from edema to demyelination and axonal loss, all producing an increased signal on T2-weighted images. Conversely, the areas of hypointense signal on fast FLAIR images may be produced by severely damaged white matter with increased extracellular water, the signal of which is suppressed, like that of CSF, by the long inversion time used. In this study, we evaluated the contribution of hypointense lesions visible on fast FLAIR images to the overall lesion burden in patients with MS. To assess the relevance of these lesions as a marker of disease severity, we tested their correlations with clinical disability and compared them with those obtained using other MR measures. The ultimate goal of the study was to evaluate whether the acquisition of a single sequence (ie, fast FLAIR) would be able to provide information that is usually obtained by acquiring two sequences (ie, T1- and T2-weighted). Patients with clinically definite MS (27), who were consecutively referred to the MS clinic in the department of neurology at our institution for routine follow-up examinations, were entered into this study after giving written informed consent. The disease course was classified, according to published guidelines (28), as relapsing-remitting (ie, clearly defined relapses with either full recovery or sequelae but without disease progression during the periods between relapses) or secondary progressive (ie, initial relapsing-remitting course with ensuing progression, with or without occasional relapses, minor remissions, and plateaus). Patients must not have been in a clinical relapse phase at the time of study entry. Within 24 hours of the imaging session, a single neurologist, who was blinded to the MR imaging results, performed a complete neurologic examination of each patient and rated the Expanded Disability Status Scale (EDSS) score (29). On a 1.5-T scanner, and in the same session, each patient underwent dual-echo rapid acquisition with relaxation enhancement (RARE) MR imaging with parameters of 3300/16,98 (TR/TE) and an echo train length of 6; fast FLAIR imaging with parameters of 9500/119, an inversion time of 2200, and an echo train length of 7; and T1-weighted CSE (768/14) imaging. For each sequence, 24 axial 5-mm-thick contiguous interleaved sections were acquired with a 250-mm field of view and a 256 × 256 image matrix, thus providing approximately a 1 × 1 mm in-plane resolution. Patients were positioned in the scanner according to published guidelines for MS studies (30). Two observers, unaware of the patients' clinical characteristics, consensually identified and marked hyperintense lesions on hard copies of the proton density (PD)–weighted RARE images, hypointense lesions on the T1-weighted CSE images, and both hyperintense and hypointense lesions on the fast FLAIR images (Figs 1 and 2). Lesion identification was accomplished in two stages. First, the images were presented in a random order, and then the different acquisition schemes were compared in order to ascertain whether lesions that were visible exclusively with one strategy could be seen retrospectively by using the others. T2-weighted RARE images were always used to increase confidence in lesion detection. MS lesions on T1-weighted and fast FLAIR images were classified as hypointense when the following criteria were met. 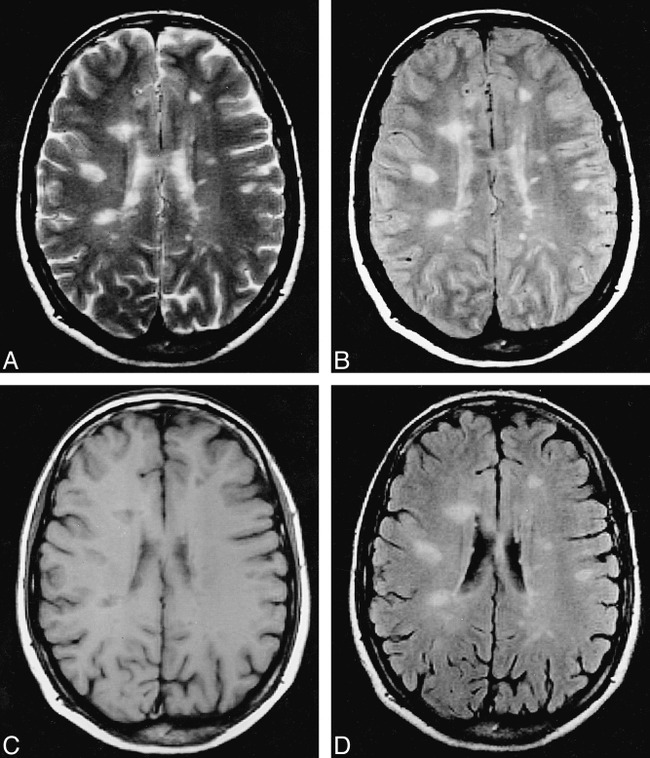 The signal intensity (SI) of the lesions had to be judged visually to be between that of gray matter and CSF, and the corresponding areas of abnormal signal had to be visible on PD- and T2-weighted RARE images (this allowed improved confidence in separating hypointense MS lesions from other hypointense abnormalities, such as enlarged Virchow-Robin spaces or arachnoid cysts). The total lesion load for hyperintense lesions on PD-weighted and fast FLAIR images and for hypointense lesions on T1-weighted and fast FLAIR images was measured by a single trained technician who was unaware of the patients' clinical characteristics. A local thresholding technique was used for lesion segmentation on computer-displayed images, using the marked hard copies of the images as a reference. The lesions were outlined as regions of interest (ROIs), and for each sequence the lesion volume was calculated by simply multiplying the total ROI area by the section thickness. Further details regarding this image analysis method have been reported elsewhere (31). Its measurement reproducibility is high for all three MR techniques used; in previous studies (22, 31) we always obtained intraobserver coefficients of variations lower than 5% when measuring the volumes of MS-related abnormalities on PD-weighted, T2-weighted, T1-weighted, and fast FLAIR images. To test the measurement reproducibility for the hypointense lesion load assessment on fast FLAIR images, the same technician repeated these measurements after an appropriate interval, being unaware of the previous results and using the same marked hard copies; the intraobserver coefficient of variation was then calculated according to the methods described in a previous study (31). From the fast FLAIR images displayed on a computer screen, we also assessed the SI for the normal-appearing white matter (ie, areas with no visible MS lesions on the same section and in the two adjacent ones) and the areas that had been previously considered hypointense lesions. SI values were obtained for the ROIs corresponding to the hypointense lesions and for a standard ROI (rectangular shape; area = 10 mm2) placed in the normal-appearing white matter on the same section (when possible) or on the adjacent ones. This standard ROI was always placed far from the gray matter and CSF borders to avoid partial volume effects from normal tissues with SI characteristics different from those of white matter. Using this quantitative approach, hypointense lesions were considered to be only those with an SI lower than that of normal-appearing white matter. These lesions were counted and their total volumes assessed, again by using the previously mentioned local thresholding technique. Differences in clinical and MR parameters between relapsing-remitting and secondary progressive MS were evaluated using the Mann-Whitney test. For each MR measure, univariate correlations with the other MR results and with the EDSS scores were evaluated using the Spearman rank correlation coefficient (SRCC). Frequency values were compared using the χ2-test. To reflect the large number of statistical comparisons, only P values less than or equal to .01 were considered statistically significant, whereas a P value between .01 and .05 was considered a significant trend. For PD-weighted, T1-weighted, and fast FLAIR lesion loads, the value with the highest probability of separating cases of relapsing-remitting from secondary progressive MS was estimated by means of receiver operator curve (ROC) analysis. To assess the MR measure that best predicted the probability of patients with MS having either a relapsing-remitting or secondary progressive disease course, a multivariate logistic regression was used. The independent variables entering the multivariate model were PD-weighted lesion load, T1-weighted lesion load, fast FLAIR lesion load (all categorized in binary variables according to the cut-off values previously established with the ROC analysis), and the presence or absence of hypointense lesions on fast FLAIR images. The dependent variable was the disease course (relapsing-remitting versus secondary progressive). Backward selection with an entry criterion equal to .05 and a removal criterion equal to .10 was used. Fifty subjects (33 women and 17 men) participated in the study. The disease course was relapsing-remitting in 32 patients and secondary progressive in 18. The mean age was 38 years (range, 19–65 years), the median disease duration was 8 years (range, 2–28 years), and the median EDSS score was 3.5 (range, 1.0–6.5). The mean age and disease duration were significantly higher among patients with secondary progressive MS (43 and 13 years, respectively) than among patients with relapsing-remitting MS (35 and 7 years, respectively) (P = .006 and .0004). The median EDSS score was significantly worse in cases of secondary progressive MS (4.5) than in cases of relapsing-remitting MS (1.5) (P < .00001). For the whole patient population, the median lesion loads were 16.8 mL (range, 0.4–84.0 mL) on PD-weighted, 2.9 mL (range, 0.0–47.2 mL) on T1-weighted, and 20.2 mL (range, 1.1–80.6 mL) on fast FLAIR MR images. Fast FLAIR lesion loads were significantly higher than the PD-weighted lesion loads (P = .001); both T1-weighted and fast FLAIR lesion loads were significantly correlated with PD-weighted lesion loads (SRCC = 0.83 and 0.98, respectively) (P < .000001). Hypointense lesions on fast FLAIR images were identified for 19 (38%) of 50 patients, and for each of these lesions, a hypointense area was visible on the corresponding T1-weighted image (Figs 1 and 2); their mean number was three (range, 0–22), and their median lesion load was 0.0 mL (range, 0.0–12.6 mL). Fast FLAIR hypointense lesion load was significantly correlated with PD-weighted lesion load (SRCC = 0.76, P < .000001). In the subgroup of 19 patients, the mean number of fast FLAIR hypointense lesions was eight (range, 1–22) and their median lesion load was 1.4 mL (range, 0.05–12.6 mL). The median ratios between T1- and PD-weighted and between hypointense and hyperintense fast FLAIR lesion load were 23.5% (range, 0.0–70.6%) and 0.0% (range, 0.0–19.4%), respectively. The mean intraobserver coefficient of variation for the repeated measurements of fast FLAIR hypointense lesion loads (as assessed from 19 fast FLAIR images with at least one hypointense lesion) was 5.5% (range, 2.8–9.6%). Hypointense lesions on fast FLAIR images were present in seven (22%) of 32 patients with relapsing-remitting MS and in 12 (67%) of 18 patients with secondary progressive MS (P < .001). The median volumes of hypointense lesions on T1-weighted and fast FLAIR images and the median ratio between hypointense and hyperintense lesion loads on fast FLAIR images were significantly higher in cases of secondary progressive MS than in cases of relapsing-remitting MS (Table 1). The differences for all the other MR measures did not reach statistical significance (Table 1). Significant positive correlations were found between EDSS scores and lesion loads for all the MR measures (Table 2); SRCC values ranged from .49 for PD-weighted and fast FLAIR lesion loads to .60 for T1-weighted lesion loads. Hypointense fast FLAIR lesions with a lower SI than that of the normal-appearing white matter were present in 11 of 50 patients, three (9%) with relapsing-remitting MS and eight (44%) with secondary progressive MS (P = 0.004). Their mean number was three (median, 1.0; range 1–13), and their median lesion load was 0.1 mL (mean, 0.6; range, 0.07–3.9 mL). Their number and load were higher in cases of secondary progressive MS (mean values, 1.2 and 0.3, respectively; ranges: 0–13 and 0.0–3.9 mL, respectively) than in cases of relapsing-remitting MS (mean values, 0.4 and 0.05, respectively; ranges, 0–8 and 0.0–1.0 mL, respectively), although these differences were not statistically significant. Using ROC analysis, the lesion volumes that separated the patients with relapsing-remitting MS from those with secondary progressive MS were 21.0 mL on PD-weighted, 5.0 mL on T1-weighted, and 23.0 mL on fast FLAIR images. When the multivariate analysis was conducted, only the presence of fast FLAIR hypointense lesions significantly separated cases of relapsing-remitting MS from those of secondary progressive MS (P = .003). The relative risk was 7.1 (95% confidence interval. 2.0–25.9), thus indicating that patients with MS with at least one hypointense lesion on fast FLAIR images have a seven times higher probability of their conditions being in the secondary progressive than in the relapsing-remitting category. Fast FLAIR images have several potential advantages over the conventional T2-weighted sequences that are currently used for studying MS. These include higher sensitivity for the detection of subcortical brain lesions (18, 20, 23, 24) and higher contrast between MS lesions and other brain tissues (16, 20). Some limitations to the extensive use of fast FLAIR imaging in large-scale, multicenter studies may, however, arise from its low sensitivity for detecting lesions in the posterior fossa (18, 20, 23, 24, 32) and from the difficulty of sequence standardization across multiple centers. It has recently been reported (33) that the interscanner variability for lesion volume measurements on fast FLAIR images is higher than that obtained with CSE images. Because the correlations between conventional T2-weighted lesion burden and clinical disability are, at best, moderate (1, 2, 4, 5), several attempts have been made to develop MR sequences with the potential for providing more specific information regarding the disabling elements of MS lesion pathology, such as persistent demyelination and axonal loss. In patients with MS, it has been reported that hypointense lesion load on T1-weighted images is highly correlated with clinical disability, both cross-sectionally (8) and longitudinally (9). The presence of both hyperintense and hypointense lesions on fast FLAIR images of some patients with MS (25) suggests that this sequence has the potential for providing, in a single image, the information usually obtained with two separate acquisitions (ie, T1- and T2-weighted sequences). In this cross-sectional study, we investigated the clinical relevance of fast FLAIR hypointense lesions in a large sample of patients with MS and varying disease courses. Our data confirmed that hypointense lesion burden on T1-weighted images has the strongest relationship with clinical disability in patients with MS, although we also found highly significant correlations between EDSS scores and both PD-weighted and fast FLAIR lesion loads. The strong correlations we found between all the MR measures used in the present study and the patients' EDSS scores may be because the patient population we studied had a wide range of EDSS scores (from 1.0 to 6.5), as was reported in another study (32). We assessed hypointense lesion loads on unenhanced T1-weighted images that did not allow us to distinguish active lesions, the hypointensity of which was related to inflammation and was therefore transient. Almost all enhancing lesions appear hypointense on corresponding unenhanced T1-weighted images, but approximately 50% of them are only temporarily hypointense and become isointense within a few weeks (34). In these lesions, hypointensity clearly does not reflect permanent tissue damage. Although these transiently hypointense lesions represent a small part of the overall T1-weighted hypointense lesion burden (35), especially for patients with secondary progressive MS, some of them were inevitably included in our analysis and may have, therefore, weakened the correlation with disability. Despite the fact that the correlation between the hypointense lesion loads on the fast FLAIR images and the EDSS scores was slightly lower than that for the T1-weighted lesion loads, the number and load of these lesions were significantly higher in cases of secondary progressive MS and their presence was associated with the highest relative risk for a more disabling MS course. Twenty-two percent of the patients with relapsing-remitting MS had one or more hypointense lesions on fast FLAIR images, whereas these lesions were seen on the images of 67% of the patients with secondary progressive MS, thus suggesting that, similar to hypointense lesions on CSE T1-weighted images, they might be a specific MR marker for severe white matter disruption. The assessment of the burden of fast FLAIR hypointense lesions in patients with MS is, however, not without problems. First, hypointense lesion volumes on fast FLAIR images were, on average, only 1% to 2% of the volumes obtained from the corresponding PD-weighted images, and this is of some concern when such an approach is used for detecting changes of MS lesion burden over time. Longitudinal studies are now needed to investigate whether in patients with MS the development of fast FLAIR hypointense lesions predicts the onset of progression or whether the change of hypointense lesion burden on fast FLAIR images is associated with a more severe MS evolution. Second, we found that many of the hypointense lesions identified on fast FLAIR images were not hypointense relative to normal-appearing white matter. They were identified as hypointense by visual analysis because they often represent the core of larger hyperintense lesions. Fast FLAIR was developed to improve the conspicuity of subcortical and periventricular lesions by increasing the echo time but, at the same time, suppressing CSF (ie, fluids with very long T1 values) by inversion recovery. Thus, lesions appearing hypointense on conventional T1-weighted images, which have a long T1 value compared with white matter, may also be suppressed. Mo is the equilibrium magnetization, proportional to the PD, and inversion time (TI) is chosen to null the CSF. The theoretical shape of the curve describing the expected pixel intensities (derived using Equation 1) of MS lesions versus T1 values on fast FLAIR images, normalized to normal-appearing white matter, is shown in Figure 3. To produce this figure, the T1 value for normal-appearing white matter was assumed to be 700 milliseconds (36, 37), the T2 signal of normal-appearing white matter was assumed to be 90 milliseconds (37), and the ratio of the T1 to the T2 value was assumed to be constant over the range of the T1 values shown. 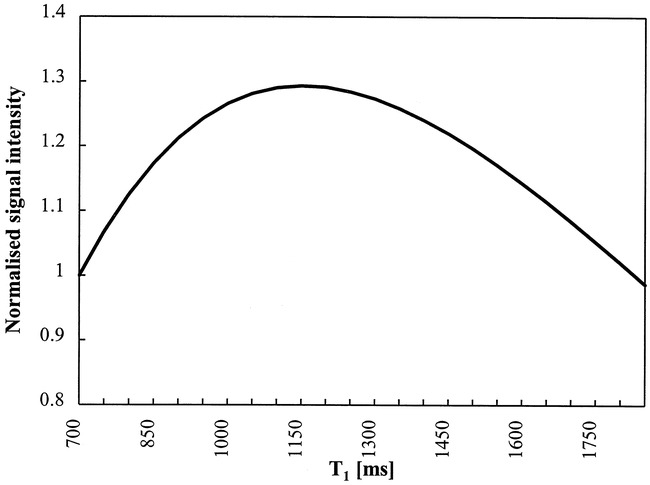 According to the graph, for a T1 value shorter than approximately 1100 milliseconds, the signal rises with the T1 value and remains higher than that of normal-appearing white matter until the T1 value is greater than 1800 milliseconds. Such values are extremely prolonged compared with the longitudinal relaxation times reported in the literature (37) for hypointense lesions on conventional T1-weighted images (ranging from 1000 to 2000 milliseconds) and, thus, probably reflect severe damage. When we considered only fast FLAIR hypointense lesions with SIs lower than that of normal-appearing white matter, these were present in approximately 20% of the patients, more frequently (44%) in the group with secondary progressive MS. The high specificity of this approach in detecting “severely damaged” lesions may have weakened the correlations between the lesion loads and the EDSS scores by missing “mildly damaged” lesions, which may contribute to the disability, particularly when located in clinically eloquent brain regions. In addition, the lack of corresponding contrast-enhanced T1-weighted images did not allow us to establish whether some of the hypointense lesions on fast FLAIR images corresponded to areas of enhancement (ie, to active, transiently hypointense MS lesions). Finally, one might argue that the low numbers of hypointense lesions visible on fast FLAIR images may render their measurement poorly reproducible. This is more of an issue in MR imaging-monitored clinical trials, in which small lesion load changes need to be detected over time (4) and, therefore, increased measurement variability (2) may reduce the likelihood of showing a treatment effect. Our data suggest that fast FLAIR imaging may provide useful information regarding different MS pathologic substrates with a single acquisition. Low sensitivity of fast FLAIR imaging for detecting hypointense MS lesions, however, may limit its reliability when assessing disease severity and evolution during clinical trials. Longitudinal studies aimed at investigating the clinical relevance of changes of hypointense lesion burden on fast FLAIR images in patients with MS are now needed to clarify this issue. We thank Mark A. Horsfield (Department of Medical Physics, University of Leicester, Leicester, England) for comments and suggestions during the manuscript preparation, Maria Pia Sormani for help in performing the statistical analysis, and Clodoaldo Pereira for technical assistance in collecting MR data. ↵1 Supported by a grant from the Associazione Italiana Sclerosi Multipla (Genova, Italy). ↵2 Presented as an oral communication at the annual meeting of the American Academy of Neurology, Minneapolis, April 1998; and at the 14th Congress of the European Committee for Treatment and Research in Multiple Sclerosis, Stockholm, September 1998. ↵3 Address reprint requests to Massimo Filippi, MD, Neuroimaging Research Unit, Department of Neuroscience, Scientific Institute Ospedale San Raffaele, via Olgettina 60, 20132 Milan, Italy.